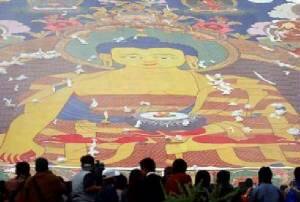 The hanging of the Brocade image done annually. 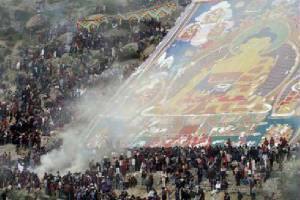 Pilgrims look at a huge silk portrait of the Sakyamuni Buddha with incense burning on a hillside above the Drepung Monastery in Lhasa, the capital of Tibet, Sunday, Aug. 15, 2004 in China. 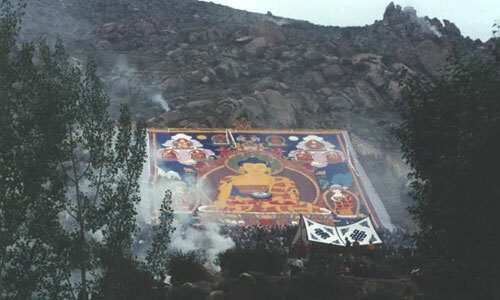 Thousands of pilgrims climbed the hillside to view the 42 meter-high portrait, or tanka, which was unveiled in a ceremony to celebrate the anniversary of the birth of Buddha. 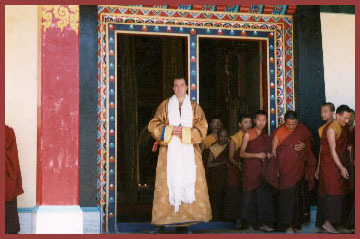 The ceremony has been performed annually at the monastery since the 15th century. "The unfolding of all phenomenon is a manifestation of the miraculous activity of the divine." 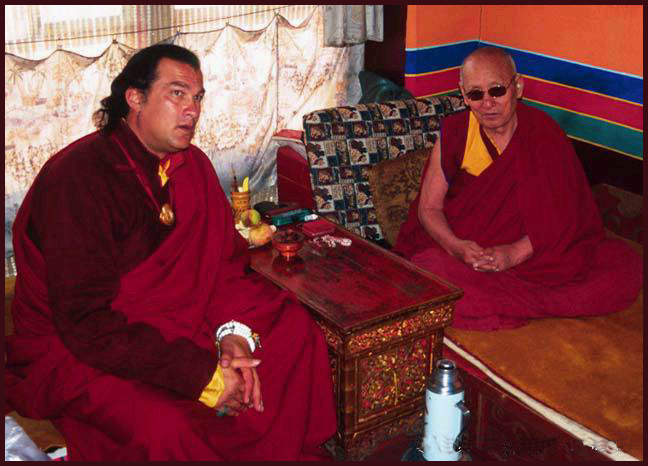 Steven Seagal lived for a while in Tibet as a Buddhist Monk. 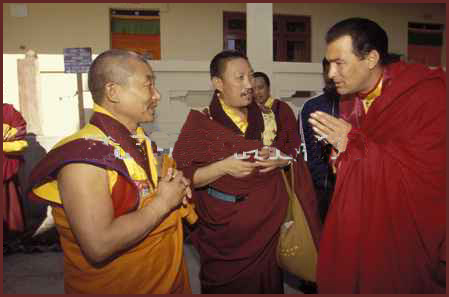 HH Penor Rinponche, who is on of the greatest leaders of Buddhism and also was the spiritual leader of Seagal, claimed that Seagal is the reincarnation of Kyunk-Drak Dorje (Chungdrag Dorja) who was a divine Buddhist Monk in Palyul Monastery. 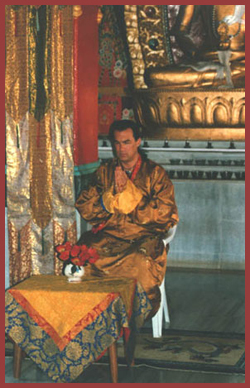 This is why Seagal is a blessed person and a Buddhist Priest. 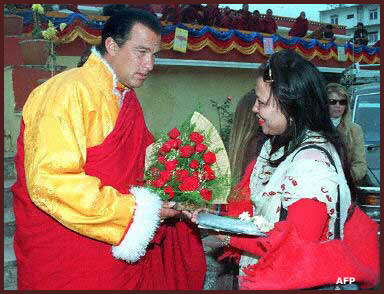 The special photographs above was sent to me by Tenzin Chophak / Tulku Shereb Gyaltsen Rinponche who is a close friend of Mr. Steven Seagal. 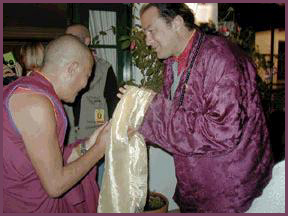 "I just wanted to thank you for such a wonderful website dedicated to my dear friend and Dharma Brother, Take Sensei/Terton Rinpoche Steven Seagal. 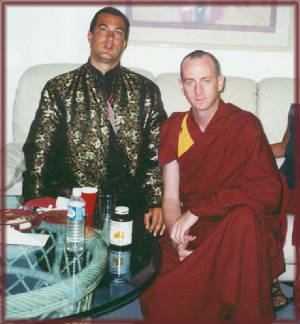 I have known Steven for over 10 years now and have shared many times with him at his home in L.A. as well as spending time in India and Nepal (where we have the same Buddhist teachers.) 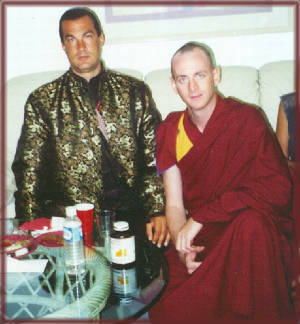 I am a Buddhist monk, having been ordained by HH the Dalai Lama. 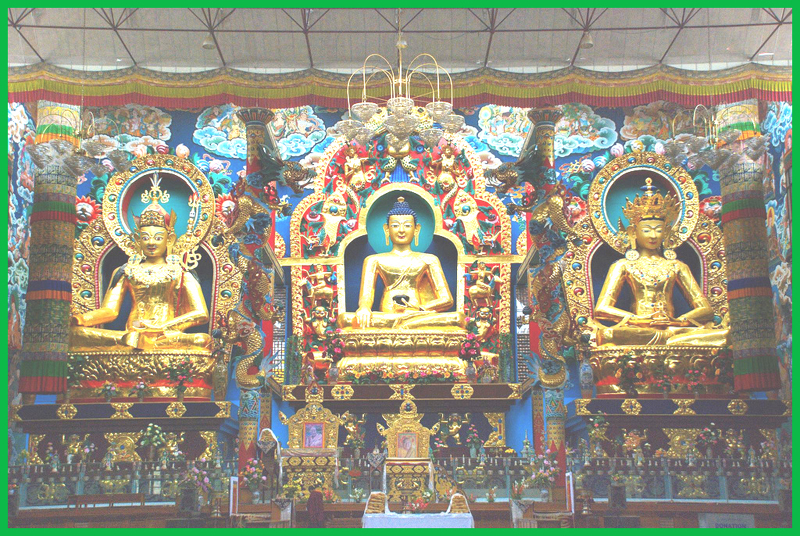 I have lived at Namdroling Monastery in south India. 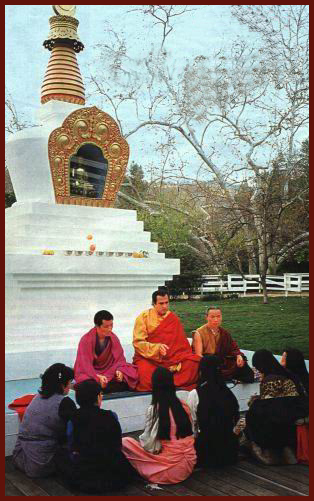 I am back in the USA now, pursuing my Ph.D. here at Stanford University in Buddhist Psychology. 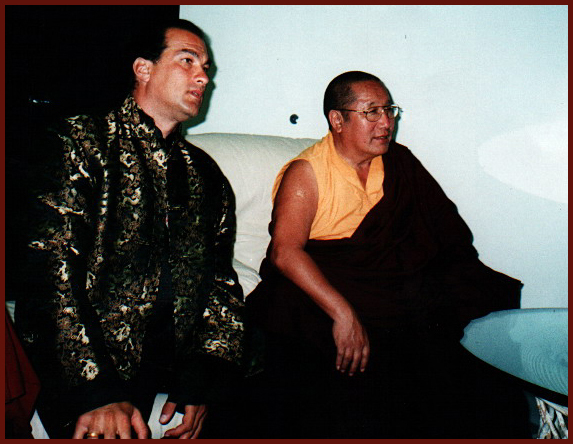 I last met with Steven back in late October 2003, just before I left for Thailand to do a meditation retreat. I thank you again for putting together such a wonderful site dedicated to a dear friend, a teacher and my mentor. 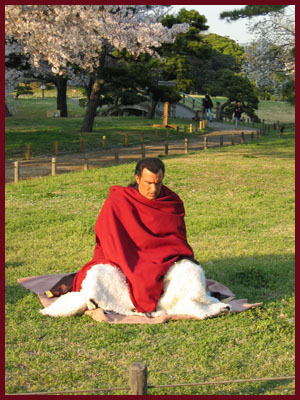 Pashmina, which the Buddhist Monks wear, is one of his specialties in dressing. He uses bracelets called mala, which is believed to serene the spirit and the lives of Buddhist Monks. 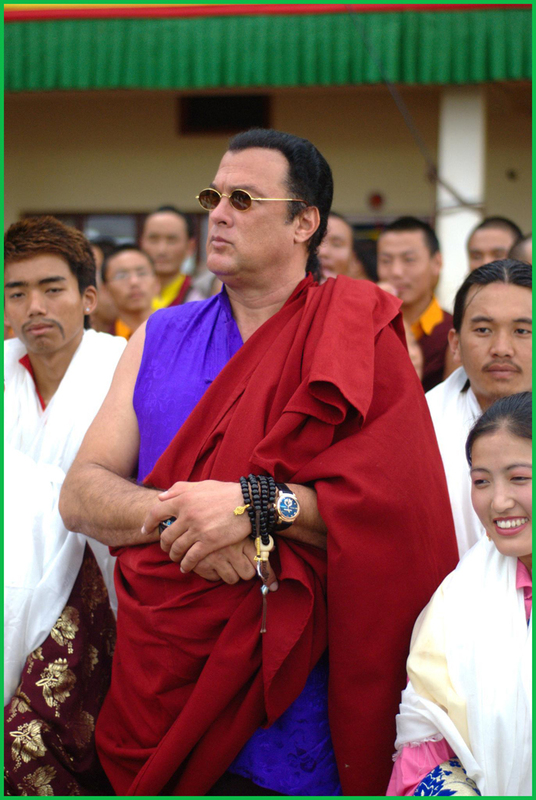 Steven Seagal has since presented himself as a serious student of Buddhism who spends many hours meditating, studying, and practicing the tenets to help him become a teacher and healer. 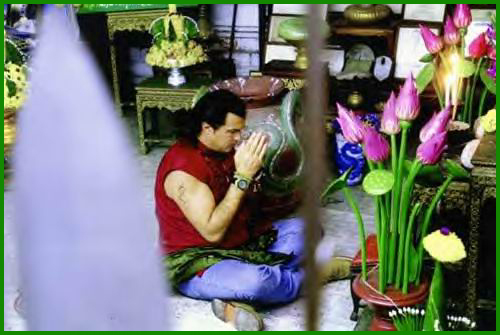 As common in other religions, he follows the Buddhist Teachings on loving human, nature and animals in his daily life. 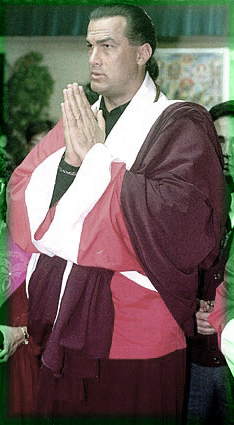 "I consider my worst enemies and my worst sufferings to be my greatest teachers". Shortly he means to learn lessons from life is the best way to strugle with life. 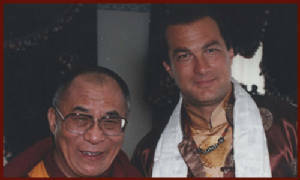 Actor Steven Seagal in Parade and on Larry King Live. 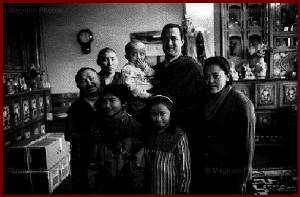 Steven Seagal " The Action Lama "
The Yangsi in the arms of the Steven SEAGAL surrounded by, at left, his 16 year old brother Phagchog Rinpoche, who is also a reincarnated Lama, his parents and two sisters.Coronation of Ugyen Tendzin Jigme Landhrup, Dilgo Khyentse Rinpoche's (one of the most revered Buddhist masters of this century) reincarnation (or "Yangsi"). 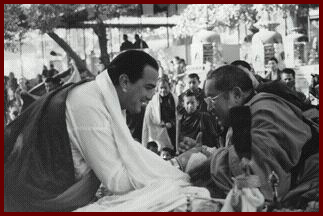 Two or three years after their death, important lamas are reincarnated in the body of a child. 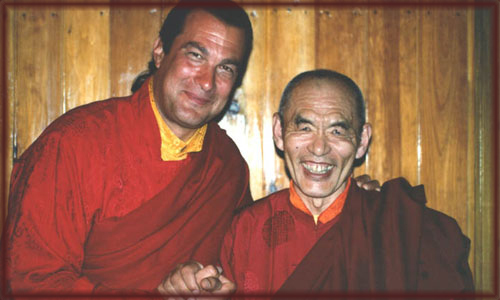 The search for this child is based on the information left by the lama himself: dreams, visions and the intuition of other lamas. The Tulkus are discovered at 3 or 4 years of age, declared at about 4 or 5 and then enter the monastery at the age of 6. 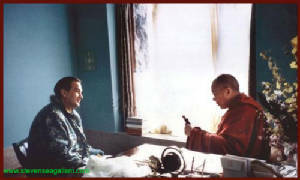 According to the rules of the monastery, each Tulku is instructed by a tutor and is either prevented or restricted from seeing other young monks from their age group. 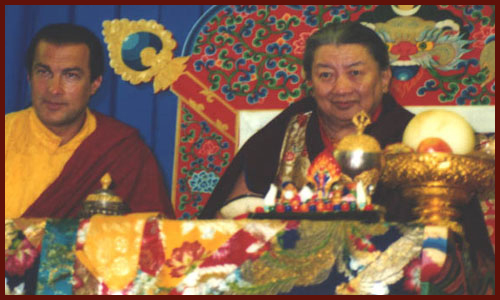 All the Tulkus are called Rinpoche which means "the precious one". 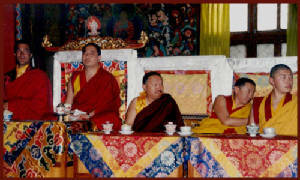 On Thursday evening, July 25, 1996 His Holiness was the guest of honor at a Benefit Reception for the Chamtse Ling. 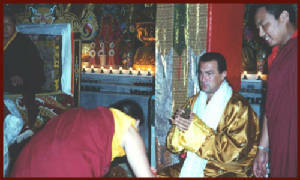 Steven Seagal, the well-known actor, hosted this event. Q - As an Aikido master who uses his skills in action-packed, good guy vs. bad guy Hollywood movies, how do you try and dispel the perception that martial arts is about learning how to fight? A - The fundamentals of Aikido are based on the manipulation of energy. Martial arts is about the harmonious balance of body, mind and soul. It’s not about fighting. I have tried in my own humble way to express the lessons and share the wisdom of the art through my dojos and films. It’s a real journey. I developed an interest in martial arts at the age of seven; I think it was my calling. 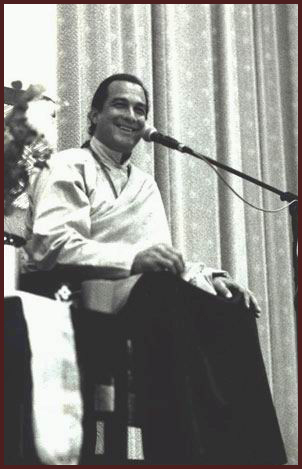 Q - When did you first decide to learn about Buddhism? 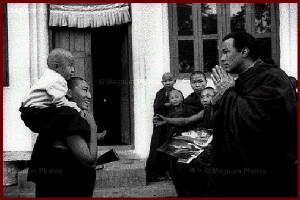 A - Growing up in the East, the path of Buddhism or the Buddha became an integral part of my being, not just my lifestyle. Living in Japan and studying there aided in my Buddhist interest. Q - Was there a defining moment in your past that changed the way you looked at life? If so, what was it? A - Everyday brings about great lessons in life. There are many defining moments for all of us. I think the birth of my children and the experience in those moments taught me a lot. 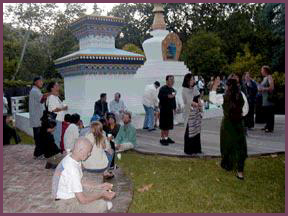 Q - What are the core principles of the religion that drew you towards Buddhism? 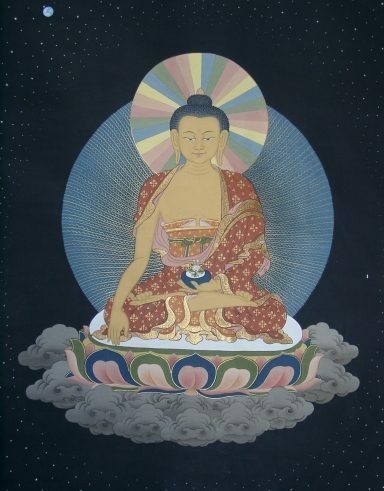 A - Impermanence, meditation and prayerful thinking. Q - Highly engaged in both the eastern and western world, do you ever find yourself caught between the excessiveness of the West and the simplicity of the East? A - I seek balance in all that I do. I spend hours on a daily basis in silence and meditation. Q - You’ve had a few marriages and many relationships…do you believe that spirituality fits into a relationship? If so, how? A - Spirituality is the essence of life. Marriage or a relationship is another medium for us to practice the principles of understanding, trust and love. Q - Do you believe in soul mates? Do you think you’ve found yours yet? some great minds and souls. Q - What fuelled your interest in doing charitable work in India? A - Seers have told me that I was born in India during many of my past lives. I love India and the people of India. 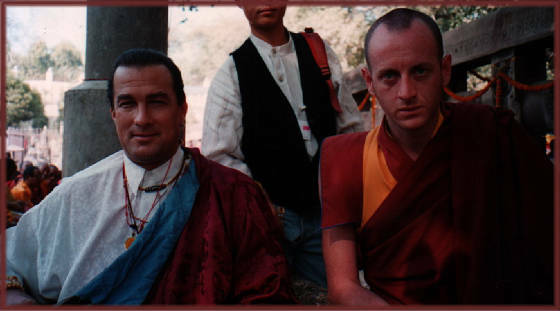 I have been to India many times and have worked with many there. 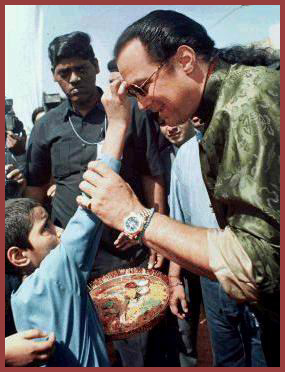 I have given millions to charities around the world, and India has been close to my heart. Q - You have also embarked on a new professional path composing and performing music - something that you’ve explained as playing an important role in your life. Why? A - I've been playing the guitar for many years now. Music is the language of the Gods, and I really find immense joy in music. My band is called Saraswati after the Indian goddess. Music is a creative outlet for me. Q - What is your proudest accomplishment? 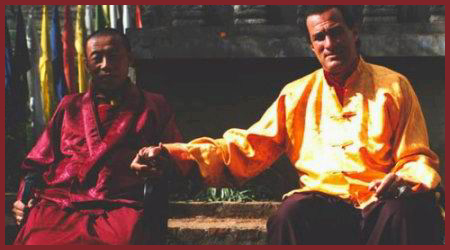 A - As a Buddhist, life is a journey that brings about many opportunities to help each other. I am just happy to share my life by helping people around the world and working with children. Q - Who is your role model? A - All my gurus and teachers. Q - What big projects are you working on next? A - Films, music and my ranch. I have been working on expanding my line of essential oils form my ranch in Mt. Shasta, and it’s very exciting. Q - People seem to judge a celebrity from what they see on screen or hear or read. How do you deal with negative publicity about you? A - Wish them well and move on. In this business, all kinds of things get wrongly communicated. Bad press is just another platform for the appetite of the profane ordemonic. One cannot focus on those things. Q - If you were able to share a piece of wisdom that you have collected over the years from Asian philosophies, what would it be? A - Life is a miraculous activity and we should all strive to become better people and find ways to help those around us. Let’s continue to make this world a better place. 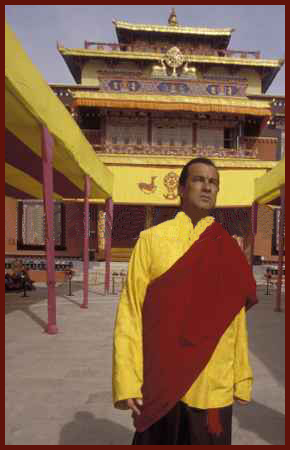 In this movie telling about Tibet, Buddhisim and teaching of Buddhisim. 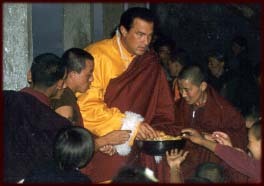 Many celebrities who are buddhist themselves including Mr.Steven Seagal takes part. 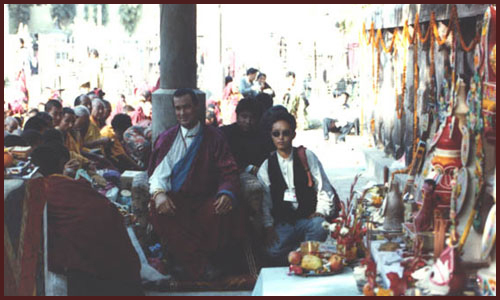 Namaste - "Day of Free Tibet"
10 December 1997,Bodnath, Nepal, Actor Steven Seagal, a practicing Buddhist, attends an enthronement ceremony for a young lama at the Shechen Monastery. "When I was young, and I'm not trying to talk like an old man, I was lucky enough to have teachers who were very honorable, very moral and yet very strict. I'm one of the few people who got to study with martial arts teachers from the Meiji era, the last of the samurai. They were strict enough to build character. My message to the youth of today is to find the best people to be around. Pay attention to things that have some kind of essence in morality. Become warriors willing to help others."